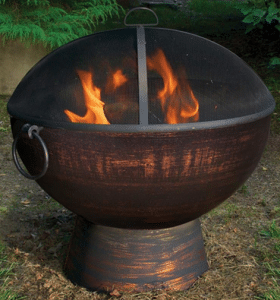 These five Backyard Fire Pit Ideas will be small enough to move to any location. If you have several areas that you like to sit by a Fire Pit, you only have to have one Pit. Some of the options will give you a better idea of what will work best in your outdoor space. Make sure you pay attention to some of the details on each of these items as some options come with each Pit and some you will have to purchase separately. All of the options below are wood burners. This metal steel fire pit has a copper finish on all of the big parts. It comes with a spark guard(top screen cover) and poker tool. You can use the forked poker tool to remove the spark guard when tending your fire. The stand and bowl are separate parts, you can empty your ashes without carrying the whole fire pit. The bowl is 30 inches across and 4 inches deep. The total height is 19 inches. Total weight is about 10 pounds, it will be easy to move to another location when it is cool. The poker tool is about 13.5 inches long. This is a shallow bowl with no drain holes, must be covered (cover is not included) or stored inside during wet weather. 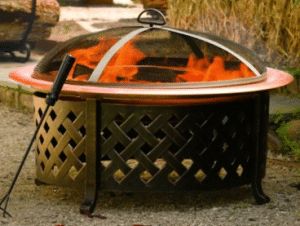 This steel fire pit has a copper painted finish and will match if you have lattice any where in your outdoor space. It comes with a spark guard, bottom grate and forked poker. It is very similar to the Celtic Knot type of fire pit, the bowl is removable for emptying ashes.. The bowl is 30 inches across and 5 inches deep in the middle. The bowl does not have a drain hole, you will have to store inside or get a cover to protect from the elements. The pit will stand 21.5 inches tall. It is about 25 pounds when assembled. Some customers stated that the holes on the lattice sides and legs did not align very well when trying to assemble this fire pit. If you are looking for something a little different, this will be it. When not using as a fire pit, the top converts this unit to a small table. The hammered copper top and bowl will give this fire pit a rustic look. The solid base with small arms holding up the bowl are painted matte black. Ready for a fire just remove the top and fill with wood and enjoy. The bowl is 29.5 inches across and 5.5 inches deep. 15 inches tall using as a table, 24 inches tall when domed mesh spark guard (included) sits on top of your fire. The included 13.5 inch forked poker will help keep your fire going. 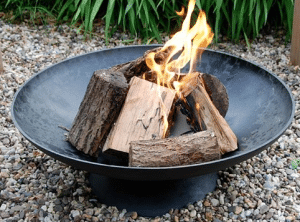 This Fire Pit is a great dual purpose piece for entertaining. This simple two piece design is very heavy. This is a very heavy cast iron with a matte black finish. Some customers state that the finish will burn off. No spark guard, cover or poker included. The bowl is almost 31 inches across and 11 high when assembled. Assembly is just 3 Phillips screws holding the bowl to the stand. At almost 88 pounds this will not be as portable as some of the other Fire Pits in this article. Looking for a fire pit with a deeper bowl to hold more wood, this one has the deepest bowl. 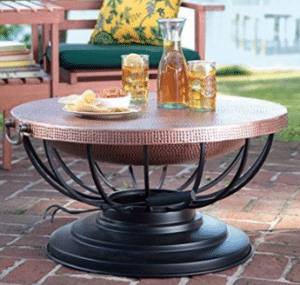 Bowl and base are made from Galvanized steel to make it weather resistant. The high domed spark guard mesh is made from steel. This pit is 26 inches wide and 27.5 inches tall with the spark guard installed. 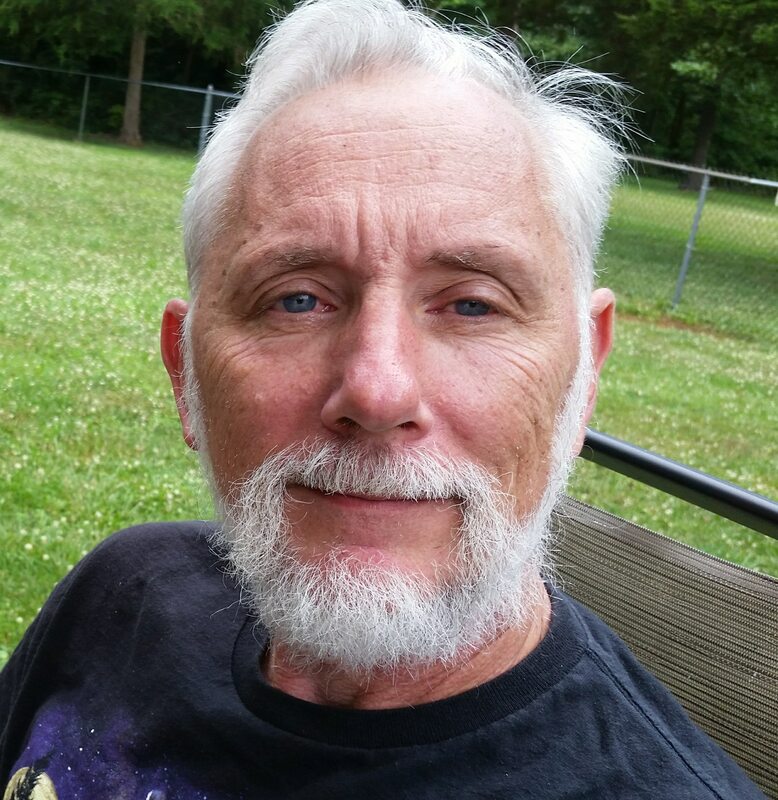 Two metal rings will assist you when you need to move to another location. 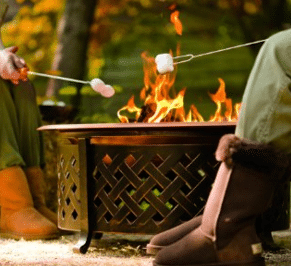 When using a Fire Pit, several safety items must be followed. The bottom of the pit gets very hot when you have a fire, if you use on a wood or composite decking material please see my recommendation here. If you are looking for other accessories for your Fire Pit please see additional information here. Please use a spark guard as much as possible, it will prevent the spread of your fire. Be careful of the metal getting hot when you have a fire, especially if you are doing any thing with kids or adult beverages involved. Am I sounding like your mother? None of these fire pits come with a weather cover, if you store them out in the weather they will not last as long due to moisture. I have keep mine out of the weather and it has lasted ten years without a rust through in the bowl. After reading about these five Backyard Fire Pit Ideas, you will have a better idea what is available. They have very different features and size. You choose what is your style and purpose. Thanks for reading if you have any questions or comments please use the form below. Don't forget to share this information with your friends with the social buttons in the black box below. I love reading about outdoors and stuff related to doing your garden and backyard – this site is definitely on my watch list. These fire place ideas looks great especially when you want to enjoy the outdoors in winter. Also great when you have family and friends over – great idea to have in one’s backyard. You can use these all year round, we have hot dogs and marshmallows in the summer on our Fire Pit. They are great for entertaining or just sitting around with your favorite adult beverage. Having asthma is not good when working with fire outside. You might want to look at some of the chiminea fire pits that have a tall chimney and the smoke will go above your head. These Fire Pits can be used all year long. Just move to another site and it will be like your in another state. Backyard Fire Pits. In fact, you you made me wanna eat marshmallows on fire (like in the pic). Its a wonderful idea to have a backyard fire pit – It can be a great way to sit down with people, relax and talk about life. It’s like cigarettes, people always find something to talk about when they smok cigarettes together. Thes Fire Pits are a great gathering spot for cold or chilly nights. The smaller ones can be moved to the location you want to meet at. Being round people can sit on all sides except the smoke side. Great for those tall tales after you have had a couple of adult beverages. We have a cauldron style pit. We have used it in all four seasons. It’s pretty in spring and summer, cozy in fall, great for warming up after sledding in the winter. We have even taken it camping when a covered fire is necessary. Having a smaller Fire Pit is a great advantage when you use it all year round. All of these can be portable and be taken to any location to have a safe fire. Winter is nearly over here in Australia however these backyard fire pits are still so fun. They create atmosphere in your backyard for sure. One thing I want to ask though, is the bottom of them heatproof? As in can I put it on my deck? The bottom of a fire pit is not heat proof. If it sits on any combustible or composite material it should have some kind of heat barrier. Look at my post on the DeckProtect system and you will see one of the best on the market. 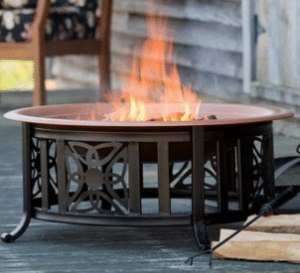 This is an awesome information about backyard fire pit ideas for small patios.This are the best backyard fire pit ideas because they are well explained and how it works and yu did well by explain everything clear even these who didnt understand it, you make them understand. Having a backyard fire pit is a great addition to your outdoor space. Knowing how to use it with still protecting your home and other outdoor items is a must. Anytime you play with fire you should know what you are doing.